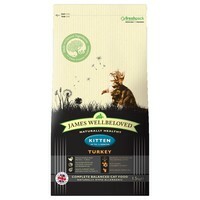 James Wellbeloved Kitten Food is a carefully crafted and nutritionally balanced food for kittens from 6 weeks up to 12 months of age. Made with natural and wholesome ingredients, including a single source of animal protein, James Wellbeloved Kitten contains all of the vitamins, minerals and nutrients your kitten needs for the early stages of their life. James Wellbeloved Kitten is also naturally hypo-allergenic which will reduce the chance of causing any adverse food reactions.